A retired University of Maryland professor won the Nobel Prize in economics yesterday for his work in applying game theory to a number of complex international issues, including nuclear deterrence and arms control. Thomas Schelling “had a profound impact on military theorists and practitioners in the Cold War era, played a major role in establishing ‘strategic studies’ as an academic field of study and may well have contributed significantly to deterrence and disarmament among the superpowers,” said the Royal Swedish Academy of Sciences in describing his accomplishments. He shared the award with Robert Aumann of the Hebrew University of Jerusalem. The two described the idea that adversaries could avoid conflict by establishing credible counterstrike capabilities. Such theories of deterrence helped to prevent a nuclear exchange during the Cold War, according to the Washington Post. Kazakhstan has nearly completed a project to eliminate tons of nuclear weapon-usable uranium by converting the material into fuel for nuclear power plants, officials announced Saturday. Following the collapse of the Soviet Union, Kazakhstan found itself with a variety of nuclear weapons and facilities. More than 1,400 nuclear warheads were returned to Russia in the early 1990s, but tons of highly enriched uranium have remained in the country, creating a potential target for terrorists seeking nuclear weapons. To address the risk, Kazakhstan moved 2,900 kilograms of fresh reactor fuel, containing as much as 26 percent of the weapon-usable isotope U-235, to a facility where technicians have begun to blend the material down into lower concentrations that can be used for civilian power reactors. The highly enriched uranium contained enough material for as many as two dozen nuclear weapons, according to a press release. The down-blending process began early this year and is expected to be completed by January. The Nuclear Threat Initiative shared the $2 million cost with Kazakhstan’s nuclear agency and the International Atomic Energy Agency has supervised the process, according to a press release (Nuclear Threat Initiative release, Oct. 8). Several U.S. Energy Department nuclear programs are significantly behind schedule and over budget, the Albuquerque Journal reported Sunday. The National Ignition Facility, meant to simulate conditions within a nuclear weapon as it detonates, was supposed to cost $1.1 billion and be finished in 2002. Instead, the project at the Lawrence Livermore National Laboratory in California is now budgeted at $3.4 billion and is due for completion no earlier than 2008, the Journal reported. Laboratory spokesman Bob Hirschfeld said the problem arose because scientists were working on something completely new. “Nobody had ever done this before,” he said. The laboratory has successfully stuck to a budget and schedule developed in 2000, Hirschfeld said. Critics, however, argue that some funding for the project has been hidden in other DOE budget areas, and that the National Ignition Facility will ultimately cost more than $5 billion. The facility was due to attain nuclear fusion capability in 2010. The Energy Department last year pushed that back to 2014, but reinstated the earlier date after coming under fire for the delay, according to the Journal. Cost estimates for the DOE Dual-Axis Radiographic Hydrotest Facility at Los Alamos National Laboratory in New Mexico are 10 times higher than originally planned. The facility has yet to fully achieve its planned function of producing three-dimensional X-Ray images of exploding nuclear weapons components. An unfinished machine has been conducting some work, which helps test the reliability of the U.S. nuclear arsenal. The full facility is set to be finished by 2008. A 1998 design change contributed to the delay and cost hike, laboratory officials have said. Design of a new nuclear trigger — or pit — at Los Alamos has also been troubled, the Journal reported. The laboratory had hoped to be producing up to 50 annually by 2003. The date to make 10 pits per year is now set at 2008. The project was supposed to cost $310 million, but is now estimated at $1.7 billion (John Fleck, Albuquerque Journal, Oct. 9). Meanwhile, the Y-12 nuclear weapons plant in Tennessee has maintained uranium processing research despite a 2003 explosion that occurred during the work, the Associated Press reported yesterday. The explosion caused no injuries, but contaminated a laboratory and exposed several workers to radiation. Contractor BWXT was subsequently fined $82,500. The facility is now using different equipment for testing of the saltless direct oxide reduction process, the Knoxville News Sentinel reported. “We are still investigating the process after having redesigned, basically from the ground up, the part of the process that had the problem,” said Y-12 spokesman Bill Wilburn. “That portion was torn down and examined and redesigned, incorporating lessons learned from the event” (Associated Press/The Tennsessean, Oct. 10). 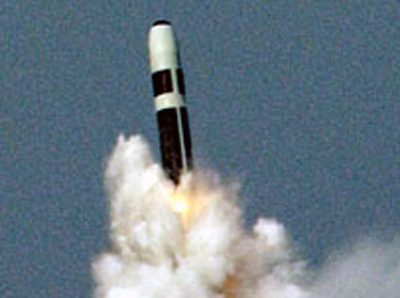 -- The first of the UK's Trident submarines, HMS VANGUARD, which is part of the UK's nuclear deterrent, successfully launched an unarmed Trident II D5 ballistic missile during a naval exercise in the Atlantic Ocean yesterday. HMS VANGUARD has recently completed a period of routine maintenance. 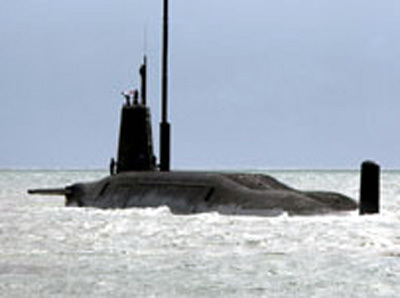 This test launch is the final part of trials prior to her return to operational service. Admiral Sir Alan West, the First Sea Lord, who was on HMS VANGUARD as an observer during the exercise, said: "I am pleased to report that HMS Vanguard's test firing has been a success. While this is very much business as usual for the Royal Navy, this firing demonstrates that the UK's nuclear deterrent remains highly effective and capable and that the boat's crew have met the stringent safety requirements for handling, maintaining and operating the system. HMS Vanguard will shortly be ready to take over duty on operational deployment. Russia over the weekend tested a submarine-launched ballistic missile, and is planning to test a silo-based missile before the end of October, ITAR-Tass reported (see GSN, Sept. 28). A submerged submarine launched the RSM-54 missile, which flew more than 6,000 kilometers and hit a target at the Kura training range in Kamchatka. “This is the sixth sea-based ICBM launch this year,” the Russian Defense Ministry said. A land-based ICBM is to be test-fired this month from the Baikonur space center, ITAR-Tass reported. “The ICBM is in one of the silos at the cosmodrome. Strategic rocket crews are checking the missile and the launching system,” an official said (ITAR-Tass, Oct. 10). Lockheed Martin Inc., Liverpool, N.Y. is being awarded a $89,000,000 firm-fixed price contract to provide for six Air Navigation/Transportable Primary Secondary L-Band, phased array, solid-state radar systems with spares, radomes, diesel engine generators, operator/maintenance training, and 12 months' technical support. This effort support foreign military sales to Pakistan. Total funds have been obligated. This work will be complete by September 2009. Solicitations began in March 2005 and one proposal was received. Negotiations were complete September 2005. The Headquarters Electronic Systems Center, Hanscom Air Force Base, Mass., is the contracting activity (FA8720-05-C-0002). Kellogg Brown & Root Services, Arlington, Va., was awarded on Sept. 30, 2005, $33,565,296 for modification P0009 to Task Order 0017 under a cost reimbursement, indefinite- delivery/indefinite-quantity emergency construction capabilities contract for Hurricane Katrina stabilization and recovery at Naval Air Station (NAS) Pascagoula, NAS Gulfport, Stennis Space Center and other Navy installations in the Southeast Region. The work to be performed provides for re-construction, re-roofing of most buildings, barracks, debris removal from the entire base, water mitigation, mold mitigation, interior and exterior repairs to most buildings, waste treatment plants, and all incidental related work. Award of this modification brings the total task order amount to $61,340,466. Work will be performed in the areas noted above, and is expected to be completed by September 2007. Contract funds will expire at the end of the current fiscal year. The basic contract was competitively negotiated with 59 offers solicited, three proposals received and award made on July 26, 2004._ _ The total contract amount is not to exceed $500,000,000, which includes the base period and four option years. The Naval Facilities Engineering Command, Southern Division, North Charleston, S.C., is the contracting activity (N62470-04-D-4017). Kellogg Brown & Root Services, Arlington, Va., was awarded Oct. 7, 2005, a $10,000,000 modification to Task Order 0016 under a cost reimbursement, indefinite-delivery/indefinite-quantity emergency construction capabilities contract (N62470-04-D-4017) for Hurricane Katrina stabilization and recovery at Naval Support Activity (NSA) New Orleans, Joint Reserve Base (JRB) New Orleans, and other Navy installations in the South Region. The work to be performed provides for re-construction, including re-roofing of most buildings, barracks, debris removal from the entire base, water mitigation, mold mitigation, interior and exterior repairs to most buildings, waste water treatment plants and all incidental related work. Award of this modification brings the total task order amount to $43,361,021. Work will be performed in New Orleans, La., and other Navy installations in the South Region, and is expected to be completed by September 2007. Contract funds will expire at the end of the current fiscal year. The basic contract was competitively procured with 59 proposals solicited, three offers received and award made on July 26, 2004._ _ The total contract amount is not to exceed $500,000,000, which includes the base period and four option years. The Naval Facilities Engineering Command, Southern Division, North Charleston, S.C., is the contracting activity (Mod P0011).